We believe a company is only as good as its relationships with its clients. 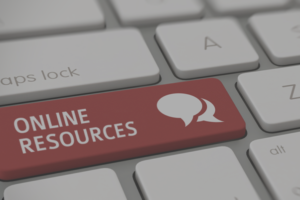 We bring you the best in restaurant training resources, learning management tools, and workplace content to help you reach your company goals. The Service That Sells! archives includes over 250 articles covering the topics of restaurant training, management, sales, service, staffing, and more! New ideas are being added every week — click here to start reading, or sign up for our free email list. Service That Sells! 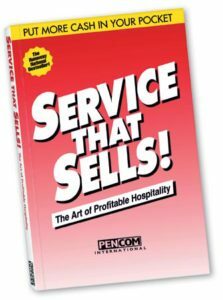 started as a single restaurant management book published back in 1991. The brand evolved to keep up with the ever-changing hospitality industry, publishing more books, updating all those books, producing DVD training, and most recently, developing Service That Sells! Online Training powered by RTO. Most of the original books are still available through our online store. Check them out! Need a boost for your next staff training session? 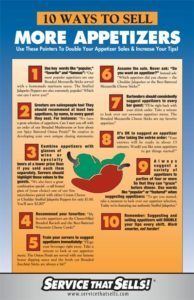 Our free downloadable posters focus ideas to help increase sales of a particular menu item, such as craft beer, appetizers, desserts, or premium drinks. Just download and print to use these product-specific posters as a visual aid to kick off your next promotion or sales content. Click here to browse our selection of free posters. All our Service That Sells! restaurant management and restaurant training books are available for download to play on your iPad, Kindle, or any digital device. Choose from the original Service That Sells! 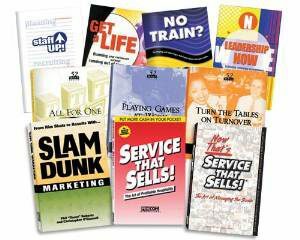 book, its sequel, quick-serve books, the 52 Ways Series and more! Click here to check them out.